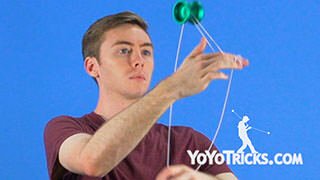 Learn three useful variations of the trick Boingy Boing for building Frontstyle Speed Combos. Boings: Vol. 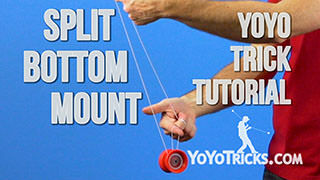 5 Frontstyle Speed Combo Series Yoyo TrickThis is the fifth video in the Frontstyle Speed Combo Tutorial Series where I will be teaching you the concept of Boings from the Split Bottom Mount. 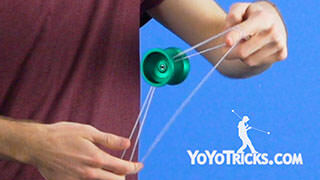 A Boing is when the yoyo is bouncing in between two parallel strings. Whether it be vertically or horizontally. 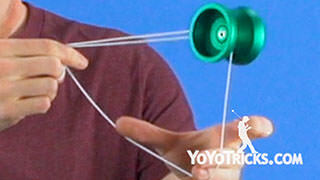 You will see that all of these tricks we are going to show are variations of the trick Boingy Boing. 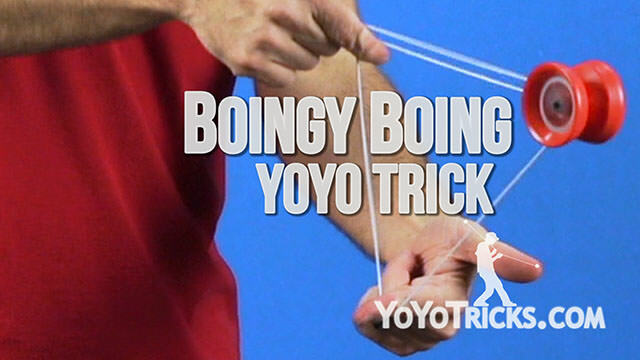 If you have not mastered Boingy Boing yet, you really have to make sure you have that down as all these variations are really going to utilize the momentum that the trick Boingy Boing creates. So, to start off, we are going to be looking at the trick known as over under boing, which looks like this. As you can see, I am using the momentum of the boingy boing to pass the yoyo above and under my index finger on my non throwhand. To achieve this, all that you are doing is when the yoyo’s momentum is pushing away from you, you are going to drop the yoyo below your index finger and let it come back towards you and use the momentum when it is coming back again to pull out above your finger. Then set it on the other side as it goes away again. You can start this momentum nice and slow. You want to slowly build that up faster and faster. That way it looks nice and smooth. Now, another useful transition to get out of Split Bottom mount back into Split Bottom mount using boingy boing looks like this. 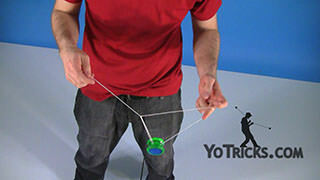 To do this, what you are doing is you are sending the yoyo outside of the split bottom mount from the back string. But you are staying inside your arms still. 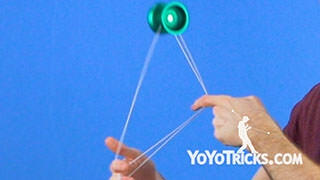 Then you land the yoyo into the front string on the split bottom mount in order to continue the momentum of boingy boing. You can see I am using my thumb to separate the gap between split bottom and make it a little bit easier to hit the strings too. You will also notice that you are no longer in split bottom mount. If I were to drop this, it is actually a green triangle. You might get an axle knot from this. So make sure not to drop it and get out of this mount before you do. To get out of it, you are simply just going to do the inverse of what you did to get in. So you will start from the front string, you will swing out the back, around the whole formation, back onto the back string and you are back in split bottom mount. Now, a harder and more advanced variation of boingy boing utilizes passes and they are called protrusions. They look like this. To do this, what you are doing to do is start with your thumb up and you are going to make a chopstick kind of shape with your non throwhand. 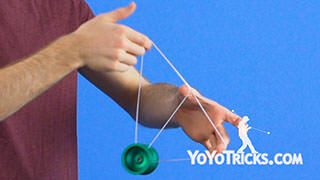 Similar to the over under boing, you are going to start with the yoyo over your thumb. 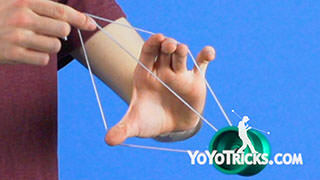 You are going to use the momentum to drop the yoyo in between your thumb and your fingers like so. Then when the yoyo is coming back you are going to tilt your thumb down and use the momentum to pull the yoyo back out through and land back into the split bottom mount. This one is pretty tricky, so it does take a lot of practice to utilize the momentum of the boingy boing, moving your thumb up and down to underpass with the chopsticks formation. 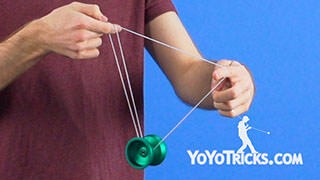 So, try taking your boing concepts and finding places in your own combos where the strings are parallel. That way you can help set the tempo for your trick and you will be even further in expanding your trick set to make the Ultimate Frontstyle Speed combo.